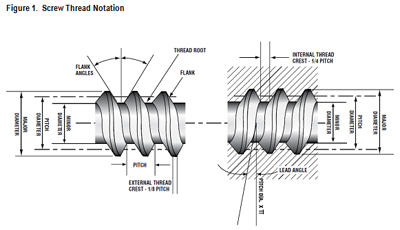 The following terms are essential to understanding screw threads and thread gages. Thread Plug Gage- is a complete internal thread gage of either single or double-end type, comprising handle and threaded gaging member or members, with suitable locking means. Thread Ring Gage- is an external thread gage employed for the size control of threaded work. American Gage Design – AGD style thread ring gages are adjustable with screws integrated within the gage body. Solid style ring gages are not adjustable and are more popular among international standards. Both styles of gages have their advantages and disadvantages. 1. Screw Thread - A screw thread (hereinafter referred to as a thread), is a ridge of uniform section in the form of a helix on the external or internal surface of a cylinder, or in the form of a conical spiral on the external or internal surface of a cone or frustum of a cone. A thread formed on a cylinder is known as a “straight” or “parallel” thread, to distinguish it from a “taper” thread which is formed on a cone or frustum of a cone. 2. External and Internal Threads – An External thread is a thread on the external surface of a cylinder or cone. An internal thread is a thread on the internal surface of a hollow cylinder or cone. Threaded work parts, bolts, buts, and threaded holes are usually manufactured in accordance with the thread classes standardized for industry and the Federal Services, Class 1, Class 2 and Class 3, for the American National Series and Class 1A, 1B, 2A, 2B, 3A, and 3B for the Unified Thread Series. These classes for a ½” – 13 thread plug gage are illustrated in Fig. 2. The Class chosen by any design engineer for a specific product will depend on its function in service. 4. Major Diameter- On a straight thread, the major diameter is the diameter of the imaginary co-axial cylinder which bounds the crest of an external thread or the root of an internal thread. 5. Minor Diameter- On a straight thread, the minor diameter is the diameter of an imaginary co-axial cylinder which bounds the root of an external thread or the crest of an internal thread. On a taper thread, the minor diameter, at a given position on the thread axis, is the diameter of the minor diameter cone at that position. 6. 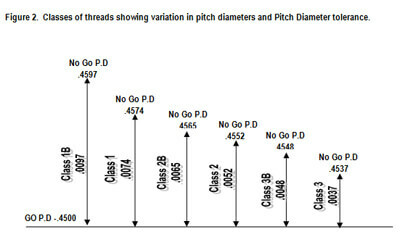 Pitch Diameter- (Simple effective diameter) On a straight thread, the pitch diameter is the diameter of an imaginary co-axial cylinder, the surface of which would pass through the thread profiles at such points as to make the width of the groove equal to one-half of the basic pitch. On a perfect thread this occurs at the point where the widths of the thread and grooves are equal. On a taper thread, the pitch diameter at a given position on the thread axis is the diameter of the pitch diameter cone at that position. 7. Pitch- The pitch of a thread is the distance, measured parallel to its axis, between corresponding points on adjacent thread forms in the axial plane and on the same side of the axis. 8. Lead- The lead is the distance a threaded part moves axially, with respect to a fixed mating part, in one complete rotation. On a single-thread screw the lead and pitch are identical; on a double-thread screw the lead is twice the pitch; on a triple-thread screw the lead is three times the pitch, etc. 9. Included Angle- The included angle of a thread (or angle of thread) is the angle between the flanks of the thread measured in axial plane. 10. Lead Angle- On a straight thread the lead angle is the angle made by the helix of the thread at the pitch line with a plane perpendicular to the axis. On a taper thread, the lead angle at a given axial position is the angle made by the conical spiral of the thread at the pitch line with the plane perpendicular to the axis at that position. 11. Crest- The crest is that surface of the thread which joins the flanks of thread and is farthest from the cylinder or cone from which the thread projects. 12. Root- The root is that surface of the thread which joins the flanks of adjacent thread forms and is identical with or immediately adjacent to the cylinder or cone from which the thread projects. 13. Flank or Side- The flank (or side) of a thread is either surface connecting the crest with the root, the intersection of which, with an axial plane, is a straight line. 14. Axis- The axis of a thread is the axis of its pitch cylinder or cone. 15. Base of Thread- The base of a thread is that section of the thread which coincides with the cylinder or cone from which the thread projects. 16. Depth of Thread- The distance between the crest and the base of the thread measured perpendicular to the axis. 17. Threads Per Inch- The number of threads per inch is the reciprocal of the pitch in inches. 18. Length of Thread Engagement- The length of thread engagement of two mating threads is the distance between the extreme points of contact on the pitch diameter cylinders or cones, measured parallel to the axis. 19. Depth of Thread Engagement- The depth (or height) of thread engagement between two mating threads is the distance, measured perpendicular to the axis, by which their thread forms overlap each other. 20. Pitch Line- The pitch line is the theoretical point on the thread through which would pass the imaginary cylinder or cone specified in the definition of pitch diameter. 21. Thickness of the Thread- The thickness of thread is the distance between the flanks of the thread measured at a specified position and parallel to the axis. 22. Standoff- The standoff is the axial distance between specified reference points on external and internal taper threaded members or gages, when assembled with a specified torque or under other specified conditions. 1. Allowance- An intentional difference in the dimension of mating parts. It is the minimum clearance or the maximum interference which is intended between mating parts. It represents the condition of the tightest permissible fit, or the largest male member mated with the smallest female members. 2. Tolerance- The tolerance on a dimension is the total permissible variation in its size. The tolerance is the difference between the limits of size. 3. Basic Size- The theoretical or nominal standard size from which all variations are made. 4. Crest Clearance- Defined on a screw form as the space between the crest of a thread and the root of its mating thread. 5. Finish- The character of the surface on a screw thread or other product. 6. Fit- The relation between two mating parts with reference to the conditions of assembly. The quality of fit is dependent upon both the relative size and finish of the mating parts. 8. Limits- The extreme permissible dimensions of a part. The method of designating a screw thread by means of symbols is by the use of the initial letters of the thread series, preceded by the diameter in inches (or the screw number) and number of threads per inch, all Arabic numerals. If the thread is left-hand, the symbol “LH” shall follow the class of thread. No symbol is used to distinguish right-hand threads. For screw threads of American National and Unified form, but of special diameters, pitches, and lengths of engagement, the symbol “NS” or “UNS” is used. Please contact Thread Check Inc. with any questions or requirements that you may have regarding thread gages and technical specifications.